Last week's FOTS 1972 Datsun 240Z was a fairly rust free little sports car waiting to return to the road when the dreary days of winter are over. This week's 1962 Chevrolet Corvair may be small but that is where the similarities between it and the 240Z end. This Corvair has its fair share of rust and its days of road use may be done forever. What better way to celebrate Ralph Nader's birthday today than with a look at the car he condemned and ultimately doomed with the release of his book "Unsafe at Any Speed" in November 1965. Although the book in its entirety was a general condemnation of the American auto industry, one chapter focused on the "unsafe suspension design" of the rear engine Corvair. In 1966 Chevrolet only sold half the amount of Corvairs they had the year before, largely because of Nader's book. 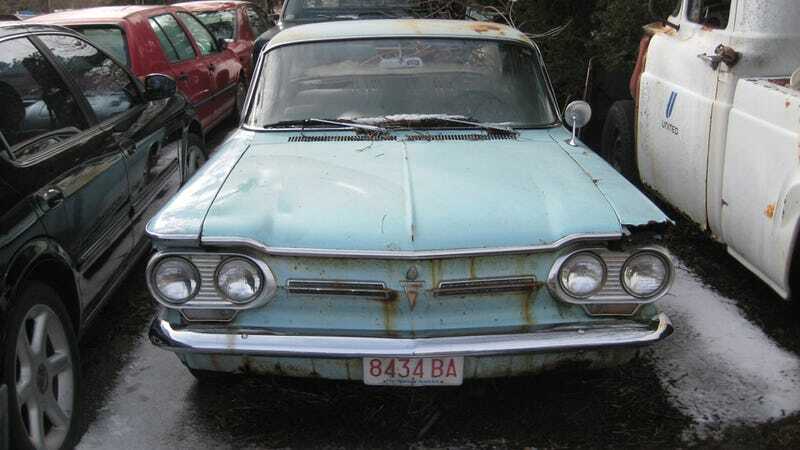 Even though Corvair production continued for another four years, the car never entirely recovered from the PR nightmare "Unsafe at Any Speed" created. The huge reaction to "Unsafe at Any Speed" has left the author and the car inextricably linked in the minds of the American public. Over 45 years later when a Corvair is mentioned it's usually a good bet Nader's name will follow shortly. The Corvair began its nine year model run with a bright future. Chevrolet's entry into the new compact car category was named Motor Trend's "Car of the Year" when it was introduced in 1960. Chevrolet completely redesigned the Corvair in 1965. The second generation Corvair had more of a focus on style and design than the previous generation and featured a variety of improvements. With an air cooled rear engine the compact Corvair was closer in design to the cars Volkswagen and Porsche were producing than conventional Chevrolets. Interestingly enough Volkswagens and Porsches of the same era shared the suspension design elements that Ralph Nader deemed unsafe in the Corvair. Our FOTS Corvair is equipped with a flat six engine that was good for 110 horsepower when it was new. This was an optional "performance engine" which bumped the horsepower up from an unimpressive 80. Although it might run if you tried, it doesn't look like this Corvair has moved under its own power in a while. The car has been sitting where it was photographed for as long as I can remember. Running and driving Corvairs are still fairly cheap and somewhat plentiful, due to their dubious reputation, love it or hate it styling and high initial sales numbers. Because of this, we can't imagine anyone undertaking the task of bringing this one back to life anytime soon. For now, it is unknown whether a return to the road or a lot more sitting is in this Corvair's future although the sea of idle automobiles that surround it would suggest the latter.